An assassin, a prince and the captain of the guard walk out of a slave camp. Their story will rewrite the world. Skip directly to page one, do not pass go, do not collect $200.00. Trust me. 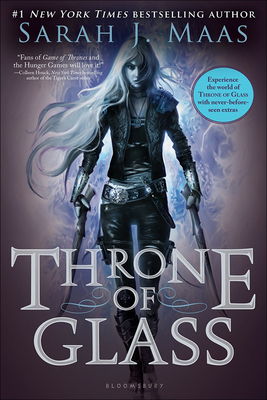 The Throne of Glass Series is a captivating series. The main character, Celaena Sardothien, was trained to be an assassin. She was caught by the royal palace, and thrown into the salt mines, a life sentence. But the king needed a new Champion, the fancy word for professional killer. Chaol, Captain of the Guard, hires Celaena to be his entry into the contest (to determine who will become the King's Champion). This takes you through Celaena's time at the castle, and into her assignments from the King. Though the author goes into much detail in Celaena’s career of an assassin, making the vivid descriptions almost to much. In a land without magic, where the king rules with an iron hand, an assassin is summoned to the castle. She comes not to kill the king, but to win her freedom. If she defeats twenty-three killers, thieves, and warriors in a competition, she is released from prison to serve as the king's champion. Her name is Celaena Sardothien. The Crown Prince will provoke her. The Captain of the Guard will protect her. But something evil dwells in the castle of glass--and it's there to kill. When her competitors start dying one by one, Celaena's fight for freedom becomes a fight for survival, and a desperate quest to root out the evil before it destroys her world.